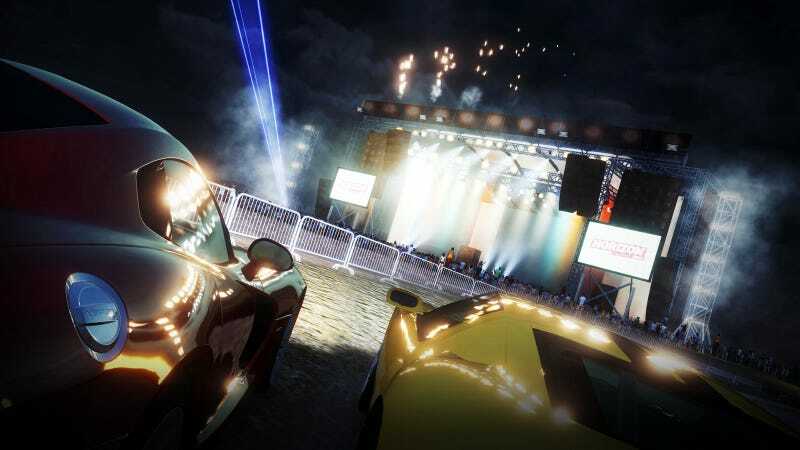 There are lot of reasons to look forward to open-world racer Forza Horizon, set to debut on October 23rd. We can now add to that list a choice of three radio stations offering the best in-game music for a racing platform since… Wipeout XL for the Playstation? We've taken the songs from two of the radio stations (Horizon Pulse and Horizon Rocks) and created a Spotify playlist so you don't have to wait for the game to be revealed to get start getting pumped. It's a mix of Indie music (Santigold, Miike Snow, Hot Chip, et cetera) and fairly modern rock with an Indie twist (Black Keys, Arctic Monkeys, LCD Soundsystem). If someone wants they can also add the Horizon Bass Arena, which is also better-than-typical video game electronica including a couple of Skrillex remixes and a DJ Fresh song with a Dizzee Rascal appearance. It may ask you to login if you don't have a Spotify account. On the price front, those who spend the extra $20 over the $59.99 price can get the Forza Horizon: Where Cars Belong special edition that gives you a special 5-car pack, custom steel book, and new liveries. On top of that, you'll have to pay out $49.99 to get the season pass for the six DLCs or pay 14% more buying them individually. Well, the music is free to listen to, at least.